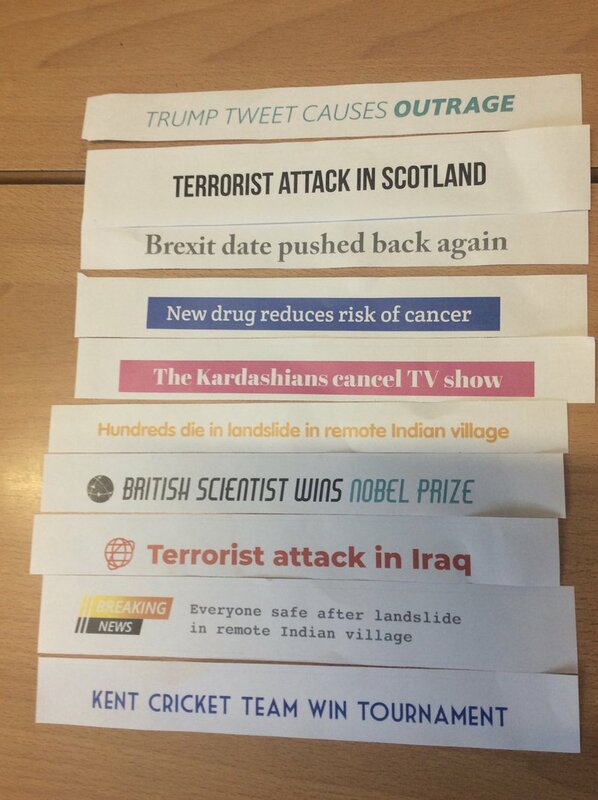 In our Burnet News Club session a few weeks ago we looked at headlines, organising them from most newsworthy to least newsworthy. I thought about what makes something newsworthy, and for the purposes of the rest of this post I came up with the idea of newsworthy being something that would spark interest and sell a lot of newspapers. I understand that there may be other interpretations and I would be interested to hear your thoughts on this. When we did this activity, I ended up changing my mind several times based on discussion with my class. My original view was that 'terrorist attack in Iraq' and 'Everyone safe in landslide in remote Indian village' were very newsworthy headlines because they talk about important events happening around the world. I thought that would catch people's attention, as they would be interested to know about these events. Things like terrorist attacks and natural disasters are always big news and cause outrage and anxiety amongst people, so putting these on the front page of a newspaper would increase sales- which is ultimately the aim of a newspaper editor. However, I then wondered whether the location of these things might affect whether or not people are eager to read about them. For example, a terrorist attack in Iraq, where things like that happen quite frequently, is less likely to spark interest than a terrorist attack in the UK. If this was happening closer to home, people would be grabbing newspapers off the shelves but fewer people might care if it happens far away as they might see it as having little effect on their lives. I don't think this is necessarily right or fair, but it is the hard truth. When I thought about natural disasters, I thought that describing the horrors (for example number of deaths, injuries, effect on the environment) is also more likely to spark interest than saying everyone is safe. Again, this would have more impact as a news story if it happened closer to home, especially if it happened in the UK. Events including people who are well-known or famous are likely to engage the reader, so having this as front page news may make people stop and look and eventually buy the newspaper. Events that happen close to home, particularly where these are horrifying or shocking or include details to make people worry about their futures, also sell newspapers. Things that happen far away or on a smaller scale (for example the Kent cricket team) are less likely to feature on the front page of one of the big UK newspapers, but may be considered newsworthy in local newspapers or newpapers from the country of the event. What do you think? How did you order these headlines? Did you have any different thoughts about what would be most newsworthy? Well done for sharing this activity! I think your reasoning here is excellent, and you've clearly explained how your ideas have developed over the course of the activity. I think most news should be newsworthy however some proven pieces should be edited out since they may be fake, such as drugs or medicines that are supposed to stop diseases. That's why my group put the cancer drug near the bottom. And I guess people would find that more interesting things are slightly negative. People wouldn't really want to hear about something that doesn't especially bother or interest them. I mean, it wouldn't be big news for us if the kardashians cancelled their channel as we don't live in America!!!) But the terrorist attack may get more attention because it's more dramatic. This is a really amazing post! We thout the cricket and the Kardashians were at the bottom. Did you think some of these headlines were fake, if so can you tell me which ones? Did you find all of this information from your classroom or did you reasearch a bit online? In my opinion, I believe that headlines would change for different people and newspapers. Firstly, it would change on each of our perspectives for example, if someone enjoyed ‘The Kardashians TV show’, they would believe that ‘The Kardashians cancel TV show’ as a major headline since for them, they believe that it is important news for them. However, a person who is a fan of cricket and supports the Kent cricket team will have a different interpretation of the most newsworthy news since they watch it often or that they are waiting for the results would come. This is why everyone has a unique view on what they believe is the most newsworthy news. In addition, the most newsworthy headline would also variate with the newspaper editor. I believe this since newspaper editors (who look at the newspapers and approve the headlines before they are published) often have different opinions on whose political party should have their bill publicised, which party should win the general election, which type of news should be on the newspapers and views on other substantial news stories. For example, if The Sun had one of the headlines they would pick either ‘The Kardashians cancel TV show’ or ‘Kent cricket team won tournament’ since The Sun focuses on news and headlines mainly based on news, sports, celebrities and gossip. Although, a newspaper like The Guardian, The Independent, The Times, Al Jazeera, Sky news or BBC news would put their top headlines as ‘Everyone safe after landslide in remote Indian village’, ‘Terrorist attack in Iraq’ ,‘Terrorist attack is Scotland’ ,‘New drug reduces risk of cancer’ ,‘Brexit date pushed back again’ and ‘hundreds die in landslide in remote Indian village’. This is because these newspapers focus on serious, current news affairs, crises and emotional news stories. Firstly, I believe that the headline ‘Brexit date pushed back again’ should be the most newsworthy headline at the front of the newspapers since this issue (Brexit) decides the fate of Britain and whether we should leave or remain in the EU. In addition, it should be the most newsworthy headline since this news headline tells that the vote has been pushed back and that tells us that the vote has not been decided yet. This will also tell the news to many of the public who are waiting for the news. This decision will last for approximately all of our average human lifespan (roughly 80 years) therefore, this headline should be at the front page of the newspaper. I strongly believe that ‘terrorist attack in Scotland’ should be the second most newsworthy headline because as it is in England, it is rare to have a terrorist attack in Scotland and hear about it. As it is rare news that will not be likely to come on the newspapers, I believe that this is the second most newsworthy headline. Moreover, Scotland is our neighbouring country as well so a terrorist attack in our neighbouring country easily makes it the second most newsworthy headline. ‘New drug reduces risk of cancer’ –in my opinion- should be the next most newsworthy headline because cancer has been an incurable disease dating back from thousands of years and even though they have special types of procedures ,such as chemotherapy, radiation therapy, hormonal therapy, targeted therapy and synthetic lethality, not everyone has survived cancer. A new drug (as well as being as inexpensive as having many procedures) will be much more reliable and many people will survive. In addition, it should be third most newsworthy because scientists and chemists would want to dig deeper into this news, know what drug it is, and save many of their patients. ‘Hundreds die in landslide in India’ should be the next newsworthy since the news is urgent and important for the world to hear and it should also be there in order for people to donate money and after, help them through the situation to create new homes, reconstruct villages and to heal the people who have been injured. ‘Trump Tweet causes outrage’ should be the next newsworthy since the news that we hear consists of America. It will be a headline that people would want to find out more about and since he is the president of the USA and a very important person. We would want to find the following questions: How could only one tweet cause outrage? What was the tweet about? In addition, was there any reason behind why he posted the comment? ‘Everyone safe after landslide in Indian village’ should be the next newsworthy because it would be good to hear that they are all safe from it but it would not be above ‘Hundreds die in landslide in India’ since it is important that they know what is happening first in order to help these people and donate money. However, it is also a relief for the public to hear that everyone was safe. ‘Kardashians cancel TV shows’ should be the next newsworthy since the news would be wanted to heard from many of the Kardashians’ fans (thousands of people). In my opinion, there are better news to hear and more interesting crises and current affairs hence why, this headline is near to the bottom of the order from the most to least newsworthy. ‘Kent cricket team won tournament’ should be the next newsworthy because the county is only from a small area in London and according to https://www.realbuzz.com/articles-interests/sports-activities/article/top-10-most-popular-participation-sports-in-the-world/, cricket is the 7th most favourite sport. This is why it is the second to least newsworthy headline on the front of a newspaper. ‘Terrorist in Iraq’ should be the least newsworthy since the news is likely to occur in the country anyhow because there is always war going on and a terrorist attack there would be certain. However, in Scotland, it is a peaceful country with no war at all so it would be extremely unlikely for a terrorist attack to happen and that is why the headline is the second most newsworthy headline than the least newsworthy. Excellent reasoning here and well done for thinking about the editorial process from the perspectives of the different newspapers. What do you think are the advantages and disadvantages of having a range of newspapers, rather than just one media outlet? This is a really good post! I value your opinion but I have several that I disagree with. 'Kardashians cancel show' I think this is one of the least important. because even though lots of people watch it there is more important news in the world. I think this one is like the Kardashians as it is not the most important. People might want to know about if their local cricket team won or not. That can be put in the particular local newspaper. 'Trump tweet causes outrage' I disagree with this because although Trump is a big topic there are certainly more important things than Trump makes a twitter comment that causes outrage. I think this should be at the top as Brexit is a major issue in the UK right now. Lots of people are wanting to keep up to date with Brexit as it is Britain's future. I chose this order as I think it is the most suitable in my opinion. I disagree with what you put on the top as most newsworthy: Trump’s tweet causes outrage. My reason is that it might be important in America, because he is the current president there. Whereas in Europe, I would put the Brexit headline at the top, as it is more important to Europe because we are involved in it. I agree with you because in a British Newspaper, I would put all of the news that ha to do with Europe first and also them important ones, for example the terrorist attacks and the ones where people die, instead of the Kardashians and Donald Trump first. Furthermore, I think there is a suitable news story for different newspapers and magazines. For example I think that the Kardashians would probable go in the “Daily Mail” and the Cricket news headline would go in a sporting news magazine instead of a newspaper, in my opinion. The advantages of having a range of newspapers is that you can listen to many perspectives and opinions. The journalists on a newspaper might have similar views on a news story to each other however; journalists on another newspaper might have unique views to the other newspaper journalists. For example, a newspaper like BBC, The Times or The Guardian might say that in the general election, they would want the Conservatives to win since they have good ideas, which will create and develop a better community. Another newspaper (like The Independent or The Telegraph) might want Labour to win the general election because they will lead the country better in different ways. If you read both of these newspapers, you will have two opinions and perspectives instead of one (which would make you only agree to that one opinion) meaning that you will know both arguments and think which is a better reason, judging by both the statements. In addition, you will have a broader knowledge of the news topic and understand more- this is an advantage. Another advantage of having a range of newspapers is that you can read current affairs but also celebrities and gossip. If you read a newspaper -like The Times, The Independent, The Guardian or BBC- you will mostly hear of current affairs and crises, such as war, emotional stories, big decisions, debates and discussions, which is happening all around the world. However, if you read newspapers -like The Sun, The Mirror or the Daily Star- it will tell all of the current sports, gossip, celebrities and talk about the current, trending news. If you read both of the news (current affairs, crises, debates, sport, gossip and celebrities), you will know more about what is happening in the news from both types of trending news stories, current affairs and gossip, and you will know wider selection of news in various fields. The disadvantages of having a range of newspapers is that you do not know which news is true since if the newspaper is bias to The Labour party or the Conservative Party (as I have mentioned earlier) might back it up using false information. It would be difficult -if you were reading from many newspaper outlets- to know which news to trust and if there is an oncoming general election, which party to choose or not. For example, if you were reading The Independent, it would be bias that the Conservatives should win since they have called in a massive protest for an eco-friendly environment. The Telegraph would want Labour to win since they have achieved many projects in the UK. If The Independent were wrong about the Conservatives making a protest for an eco-friendly environment, just to make you think the same view as them. However, you thought that they had achieved more than Labour so you vote them in the general election; it would make you think the wrong way, rather than if you had only read a legitimate, trusted news source. This is a disadvantage of reading from many newspaper outlets. Another disadvantage of having a range of newspapers is that you have read one newspaper, which shows a news story. The other has the same news however, the events of how it happened are different so you do not know what is correct. For example, if The Times says the story about how a police officer rescued a person drowning. In the newspaper, it says that a police officer threw a rope and the person held onto the rope. The Guardian it says that the police officer jumped into the water with him and hauled him out. Even though it is the same news story, did the police officer pull the person with a rope or jump in to save the person? This is a disadvantage because you do not know what events are true. In conclusion, there are the advantages of having a range of newspapers (such as being able to listen to many perspectives, opinions and being able to read about both current affairs and celebrities and gossip). However, there are the disadvantages of having a range of newspapers (such as not knowing what news is true and newspapers telling different events of what happened in the same news story). In my opinion, instead of reading a range of newspaper outlets, you should choose one or two reliable, legitimate newspaper outlets (gossip, current affairs or both) in order to have the advantages but not disadvantages. Thanks for your reply and for showing great reasoning in your response and evaluating both sides of the argument. It's impressive that you have come to a conclusion. I think you have confused the Independent (left-leaning, Labour) and Telegraph (right-leaning, Conservative) newspapers.